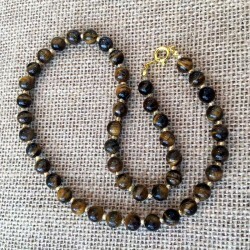 Tiger Eye bracelet handmade with rare colorful Tiger Eye perfectly polished stone beads. Choose your bracelet with 8mm or 10mm Tiger eye gemstone beads. Elastic Tiger Eye bracelet fits 16-20cm wrist. Beautiful unisex gemstone bracelet for both women and men. As Tiger Eye gemstone is a natural not dyed material each bracelet has it's own totally unique colouring and markings.